Listen we talk about the relationship between Batman and Superman a lot. Okay maybe not on this particular site, but if you google it you’ll find tons of articles about Batman and Superman (some of them are even NSFW). What’s not discussed enough is the relationship between The Joker and Lex Luthor. Granted these two characters don’t cross as much as Supes or Bats, but when they do their chemistry can be amazing. If you haven’t guessed it’s another Legion of Doom special issue! They’re will be spoilers. You have been warned. If any person ever wanted a single comic that boils down the relationship between Lex Luthor and The Joker, you need to hand them this comic. From start to finish, James Tynion dives into the madness that is Lex Luthor and The Clown Prince of Crime and to use a wrestling analogy both of these iconic villains bring out the best in one another. All their vileness and backstabbing is on full display for readers to see. From my perspective, Tynion is using the Justice League cartoon from the late 90’s as his inspiration for the dialog between Joker and Lex. but cranks the intensity by a thousand fold. Once this comic grabs you with the opening scene of Lex recruiting The Joker, it doesn’t let you. Next thing you know your chained to year seat as you watch The Joker destroy what Luthor has built. The action in this comic is far and few between, it’s mostly talking but the way Tynion frames each sequence makes the seemingly endless lines of dialog just as compelling as Joker using his classic gas to Jokerize the entire Legion of Doom. Remember kids, long sequences of dialog do not have to be boring, Granted it takes a extremely skilled writer to pull this level of quality off and Tynion is more than up to that task. I’ve maintained my stance of not wanting to read books with villain leads, but the way Tynion writes Lex Luthor I could easily be persuaded. What makes this comic outstanding is Guillem March’s pencils. I can’t remember the last time I read a book featuring March’s pencils but his style has changed a lot and it still looks gorgeous. Some might say that Guillem’s art is a bit to outlandish due to over expressive facial expressions odd body posture. Focusing on Mister J for just a moment, I love how outlandish he makes The Joker look, a twisted cartoon character turned serial killer. I won’t be ashamed to admit that March’s Joker actually makes my skin crawl from how terrifying he looks. If there’s one thing to take away from this issue is that Guillem March is a damn genius and should be praised more. My only real problem with this issue is how quick Joker split from the Legion Of Doom, yes the writing was on the wall and super villains rarely stay together long but I just loved his insanity mixed in wit the rest of the L.O.D. I’m sure this was mostly Snyder’s call to have Joker discover that The Batman Who Laughs has been released but for me personally it felt to soon for it to happen. Other wise, this issue was amazing. 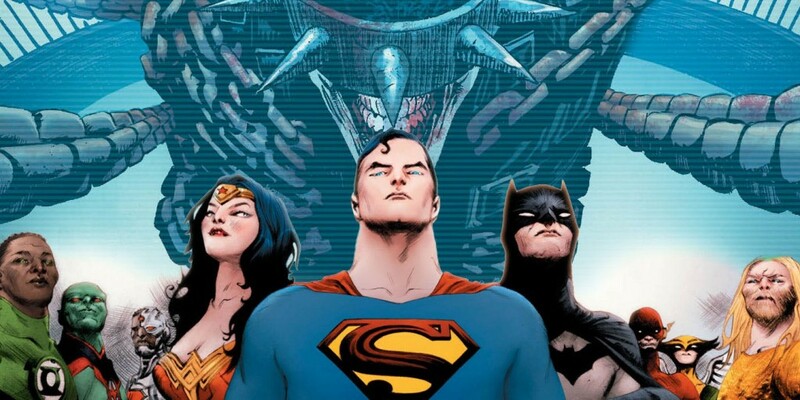 I’m glad that every so often the Justice League book becomes a Legion of Doom book, it’s nice to have a peak at evil every once in a while. Stellar issue.